Michigan lawmakers are forging ahead on a Republican-backed package of bills that would reform the state's civil asset forfeiture laws. The reforms would restore due process protections for innocent property owners and require law enforcement to be more transparent about how they are using the practice. While Michigan's civil asset forfeiture laws are better than most states, they have been abused by overzealous law enforcement due the low standard of evidence required and the perverse profit motive that exists. Under current Michigan law, law enforcement can keep 100 percent of the proceeds from forfeitures. State House Speaker Kevin Cotter (R-Mt. Pleasant) sees the problem current law presents. "The simple truth is our widely criticized law allows law enforcement to boost their budgets at auction with little or no responsibility," Cotter wrote in an op-ed at the Detroit News. "Most Michiganians have no idea this takes place, and many who do have seen their lives turned upside down with no way to hold the state responsible when mistakes are made." "These cases sound like isolated incidents of corruption and abuses of power, but they are far from it. This is state law, and the police who conduct the raids are well within their legal right to seize and sell the property of the innocent and guilty alike and bury the results. It is well past time to bring some accountability into the system," he added. In April, Michigan House Republicans, with the backing of Cotter and support from their Democratic counterparts, rolled out a package of eight bills to reform the state's civil asset forfeiture laws. Lawmakers are not looking to get rid of civil asset forfeiture, but they do want to ensure that the due process rights and private property of innocent people -- including legal medical marijuana patients -- are protected from government overreach. 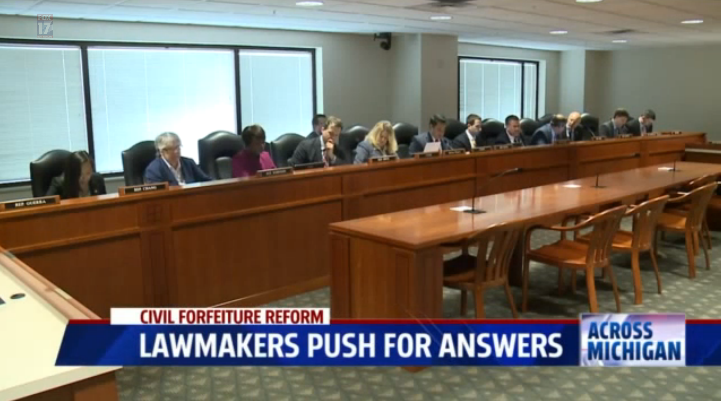 On Tuesday, the Michigan House Judiciary Committee held hearings on civil asset forfeiture reform, hearing perspectives from both supporters and opponents of the effort. Sgt. Amy Dehner of the Michigan State Police testified in defense of civil asset forfeiture, which, she said, is used to crackdown on illicit activity. Speaking to a local Fox affiliate after the hearing, she blamed the media for the backlash against civil asset forfeiture. "I think that’s largely the view of the media and trying cases in the papers," Dehner told Fox 17. "To say someone is guilty before they go to court is not something the police engage in." The reporter quickly noted that the burden of proof is on the property owner, not the government, a point she conceded. "Correct. It is," she said. "It's on what would be the defendant in these cases to come in and state their case that these assets that they have were obtained through legal means." The implication is that the person, even if they are not charged with a crime, and their property are guilty. This throws the "presumption of innocence," a bedrock legal principle, out the window. Dehner, however, does not see it that way. "I don't know that it's backwards," she said, "but it would be different from some of the other standards that prosecutors and law enforcement engage in." If law enforcement encounters someone who they believe to be engaged in criminal activity, they should build a case against that person, arrest them, prosecute them, and, if the government has proved its case to a jury beyond a reasonable doubt, sentence them to serve a punishment that fits the crime. That is due process and how the justice system is supposed to work. Civil asset forfeiture is, indeed, backward. "If you’ve got folks out there that are medical marijuana patients," said state Rep. Jeff Irwin (D-Ann Arbor), "there’s no way they should be getting raided and having police come in with masks and guns drawn and taking their assets." Medical marijuana is legal in Michigan, though regulated. There are examples of abuse like this -- including the cases of Dr. Wally Kowalski and Thomas Williams, a cancer patient. The reform package introduced in Michigan would exempt low-level offenders and medical marijuana patients from civil asset forfeiture. For far too long, lawmakers with good intentions have passed bad laws, such as very broad civil asset forfeiture statutes that encourage abuse. Law enforcement should be fully funded to protect public safety and crack down on crime, but Michigan's civil asset forfeiture laws need reform to ensure that adequate protections are in place to protect innocent people from government overreach. Thankfully, lawmakers see the problems that current law had created and are taking action to address it. Now wait a second, How am I going to falsify my overtime report to get my fair share of this money if you take the money pot go away?